The good news is that The American Spectator reviewed my new book about the beginnings of Islam and the centrality to it of peace, Muhammad: Prophet of Peace amid the Clash of Empires. The bad news is that Andrew Harrod, the reviewer, appears not actually to have read the book. He just attended a talk I gave at Georgetown. His remarks are glib and uninformed, but being a teacher I see this as a teachable moment. I miss the days of William F. Buckley, with whom I seldom agreed, but who was a real intellectual and would never have dreamed of writing a book review off a 45 minute talk without cracking the text. I actually had thought that R. Emmett Tyrell, Jr., who edits The American Spectator, was more serious than to carry such a shoddy essay. But it is true that he was capable of saying this in Dec. 2005: “The main point is that Bush has to leave the presidency with a healthy economy, which he probably will, and stability and something like democratic government in Iraq, which I believe he is closer to achieving than his critics contend.” Maybe there really is something fundamentally wrong with his judgment. Dr. Harrod has a Ph.D. from the Fletcher School, and I thought it might be valuable to attempt to engage him on his criticisms, in hopes that he is still enough of an academic to be persuadable. He does correctly state some of my premises, that Muhammad was from a clan of peacebuilders, the Banu Hashem, who hosted pilgrims at the Kaaba or shrine to God in Mecca; that Mecca was a haram or zone of sacred peace, and that I take the Qur’an as my primary source. Given that Harrod did not bother actually to read the book, he is remarkably eager to dismiss my findings, which come from years of engagement with Arabic texts, and with the history both of Arabia and the Roman and Persian empires of late antiquity (circa 200-800 AD), subjects he gives no sign of knowing anything serious about. One of the most disturbing characteristics of his essay is that it is shot through with anachronism. If you said that Lee Harvey Oswald plotted out the murder of John F. Kennedy and then shot him in 1963, that is a chronological and causal statement. If you said that John F. Kennedy died because Richard M. Nixon became president in 1968, that would be anachronistic. Nixon’s presidency couldn’t kill Kennedy because it only came about after his death. Harrod makes large numbers of anachronistic statements in his essay, i.e. kills off Kennedy repeatedly with the Nixon presidency. I was puzzled as to how someone with a high-powered Ph.D. could commit these elementary fallacies ( anachronism is a logical fallacy of the first water). But then I remembered that Sen. Ted Cruz has impressive Ivy League degrees, too. Apparently being credentialed and being educated are not the same thing. Historical scholarship is not liberal or conservative, Democratic or Republican. Perhaps liberal or conservative premises held by historians might lead them toward investigating certain subjects in the first place. But historical evidence is a harsh taskmaster and will disabuse them of their prejudices if they are good historians. Leftist historians may have wanted the workers or sans-culottes to be the instigators of the French Revolution in 1789, but decades of work in the French archives instead fingered the lesser cousins of the aristocracy. The basic tools of academic history are designed to wash out personal bias. Historians heavily weight “primary sources,” texts written down by eyewitnesses of an event soon after the event. If someone were at the Battle of the Bulge and kept a diary, the diary would be a primary source for later historians. If the soldier who fought at the Battle of the Bulge wrote a memoir thirty years later, that would still be a primary source, but it wouldn’t be nearly as fresh or valuable. It wouldn’t be weighted as heavily as a memo recorded during or soon after the event. If, however, a military history afficionado combed through memoirs 40 years after the fact and wrote a book out of them, that would be a secondary source. But that later person has a different point of view and different values than those 19-year-olds of 1944. Maybe Americans in 1944 were cheering on the Red Army in the East and hoped it would advance quickly into Germany quickly to relieve US troops in France and Belgium. But in 1984, the secondary source writer might be a Cold Warrior hating the Soviet Union, who leaves out of his account the positive views of Moscow prevalent in 1944. That is why historians want primary sources if they can get them. I argue in my book that the Qur’an is the only primary source we have for the life of the Prophet Muhammad in the period of his preaching, 610-632. And I hold that the works of history and biography written in the Abbasid Empire after 750 saw the life of the Prophet and Qur’an verses through the lens of a later martial Muslim empire, projecting military themes back into them where they didn’t actually exist. Harrod seems to be very attached to the later Abbasid accounts. But that is ahistorical. You would always prefer the primary source (the Qur’an, 610-632) to secondary sources like al-Waqidi (d. 823). I did not cherry pick the Qur’an verses, I just quoted them. And in my book I discuss the fallacy that both some medieval Muslim scholars and some modern academics fell into of seeing the Qur’an as progressing toward warlike ones. But Harrod’s point is anyway anachronistic. I was talking about the Qur’an and the earliest stage of Islam, so what later Muslim doctrine might say is completely irrelevant to my study. Harrod notes that I see a passage in The Heights, the 7th chapter of the Qur’an, as indicating that the Qur’an advises human beings to deal with the violence that attended the Fall of Adam and Eve by becoming peacemakers. This passage of Harrod’s is not anachronistic, but it does fall into another logical fallacy, of being a non sequitur. These verses do not refute what I said about the Qur’an urging people to be peace makers. Moreover, the episode of Lot and Sodom and Gomorrah is not about what we now call a gay lifestyle, which did not exist in the 7th century. The Qur’an does not describe “Jews” in 7:166 as “apes, despised and rejected.” This passage is a midrash or commentary on Numbers 11, which talks about how the some of the children of Israel when wandering in the desert got tired of eating manna from heaven and broke the sabbath to seek other food. Numbers 11:33 says, “the anger of the Lord was kindled against the people, and the Lord struck the people with a very great plague.” The rabbis who later commented on these passages said that God punished the miscreants by inflicting on them bodily afflictions.The Qur’an is saying something similar, as Professor Uri Rubin of Hebrew University has argued. This passage is not about Jews in general but retells biblical denunciations of, and the visiting of a great punishment on, the faithless. As for 7:179, it does not condemn non-Muslims as cattle. It condemns the hostile pagans of Mecca as cattle. The Qur’an promises paradise to monotheists, including Jews and Christians (2:62). Harrod’s inability to read the book contextually leads him to make ridiculous assertions. Harrod’s argument against my interpretation is one of the most grievous fallacies of anachronism ever to be committed in the history of humankind. He says I can’t be right that the procession to Mecca was peaceful, or that al-Fath here means success, because in contemporary Arabic al-fath means victory or conquest. You can’t tell what an Arabic word of the 7th century means by referring to the PLO! 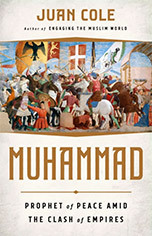 The offer of peace if the enemy will desist demonstrates that this battle was in self-defense for Muhammad’s followers. If you are fighting an attacker and the aggressor agrees to stand down, you might well accept this repentance if you were gracious. If you were fighting an aggressive war, you would not agree to an armistice just because the enemy sues for peace. As an aggressor you would want to conquer them, and of course they would always sue for peace. The Qur’an’s battles are about defensive engagements because the bellicose pagan Meccans were attacking the early Muslims in Medina (along with the Muslims’ allies in the city, Jews and Christians). An Orthodox Jewish brigade is said to have fought alongside Muhammad at the two significant battles of self-defense. This behavior of these early Jews might be contrasted with that of the Muslims who became ascendant in Mecca in January of 630 AD, who who according to the Qur’an killed no one at all. I have run out of time to reply to Dr. Harrod. I think these points give a sense of how wrong-headed his approach has been. He reviewed a book he hasn’t read. He used anachronism and the non sequitur as his primary forms of argument, both of which are the sort of fallacies not usually met with in essays by thoughtful persons. He doesn’t understand the Qur’an and hasn’t read the scholarship of giants like Uri Rubin or Rudi Paret and so commits elementary errors. The only thing I can say in his defense is that it is true that some medieval and modern radical Muslim commentators have also misinterpreted the Qur’an as being a more warlike book than it actually is, and perhaps he has fallen under their influence. If so, he could repair his and their misunderstandings by, for instance, actually reading my book (which he reviewed unseen!) and by following the footnotes and reading the literature cited, and by actually studying the Qur’an rather than cherry-picking gotcha verses that he misinterprets. The big question in my mind is why Harrod would want me to be wrong in my arguments that the Qur’an commands peace. I implore him to reconsider and to help me spread this message, a message the world needs.